The Currently Coveting items I shared in the first few months of 2018 cover everything from chairs to hardware. Here are the highlights of the items I was obsessing over from January – March of 2018. I absolutely adore the Novogratz Campbell Metal Cottage Chairs. The blend of the country meets modern style is the perfect blend for this great flex piece. The sturdy metal frame makes this amazing chair both pretty and practical. I wish I could better express how much I’m in love with this Lindsay Cowles’ wall covering. I recently turned this into a printed framed piece to add a pop of color to a master bath project, but I’m just waiting for the day when I can cover a full wall in this lively print. Any takers? Have you ever seen such cool hardware? Its leather! I’m all about taking a chance on something different. Don’t get me wrong, I love the brass and matte look, but leather…now that’s a game-changer. 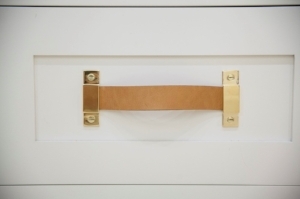 This leather hardware from Wilmette Hardware is so different and unique. It’s sure to be a conversation starter. Don’t forget to follow House of Dietrich on Instagram to see my latest obsessions!